RedLink launched Remarq™ in mid-May, and announced IOP Publishing’s adoption of the service at the 2017 Society for Scholarly Publishing (SSP) meeting in Boston. 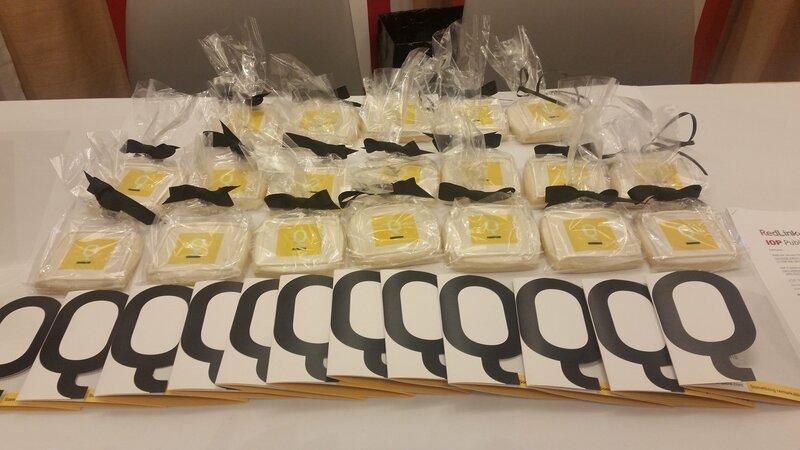 But launching Remarq (and giving away 300 Remarq “Q” cookies) represented only part of what we were doing. RedLink was a Silver Sponsor, which included sponsoring an innovative professional portrait studio allowing attendees to get new headshots done by a professional photographer at no charge (a donation to support the SSP Fellowship program was encouraged). Mary Beth Barilla, our Director of Publisher Relations, was a Co-Chair on the Annual Meeting Committee, in this her third and final year in the role. She received the SSP’s Appreciation Award for her excellent work helping to lead and coordinate this Committee and three successful SSP Annual Meetings. Congratulations, Mary Beth! RedLink’s CEO, Kent Anderson, was also busy, speaking at three sessions (the Previews session, a session on impact measures, and the Scholarly Kitchen Chefs closing session), and moderating one session on data and its uses by editors, salespeople, librarians, and strategists. Kent was also chosen to mentor a Fellowship recipient, Christen Pruitt of Wiley. Christen is in some ways the future of SSP — passionate about her work, a strong connector with great people skills, and possessing insights that are geared to help move things forward. The RedLink booth was buzzing the entire meeting, as well, with librarians stopping by to find out more about Library Dashboard, publishers wanting to learn more about Publisher Dashboard, SiteLeads™, and Remarq, and friends old and new pausing to shoot the breeze and take a moment to connect. RedLink also held a client and partner event on (luckily for us!) the most beautiful evening of the week. Nearly two dozen RedLink friends set sail on Boston Harbor toward DownEast Cider, a local startup hard cider producer that is growing rapidly. Making unfiltered cider out of only natural ingredients, DownEast is everything a startup should be — interesting, exciting, and promising. Their cider is delicious, and everyone enjoyed a tour, many tastings, and delicious local pizza from the legendary Santarpios, followed by a nighttime cruise back across the shimmering waters. The SSP Annual Meeting is always a highlight of the scholarly publishing and communications calendar, and this year in Boston was no different.